There is no doubt that we all would like our smart phones to last longer on a single charge. Some devices have removable batteries while others like the iPhone 6 require you to plug-in to recharge your phone. So what if there is an outlet available? Well then you might find yourself in trouble. This generally happens to me when I’m at the airport because inevitably there are people already using the limited amount of AC plugs available. 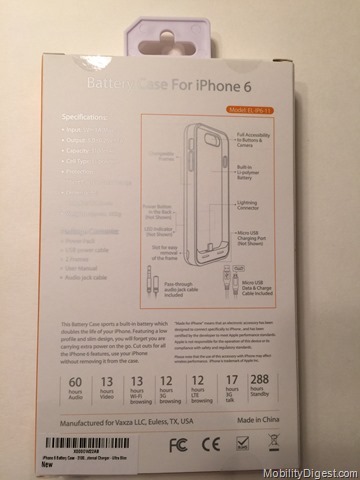 I have found a great way to combat this problem is to use a case for my iPhone that has a built-in extended battery. This is made my life a lot easier and allowed me to get through a full day of power using my phone while traveling without needing to plug it in. So now that Apple has released the iPhone 6, I found myself needing a new case with extended battery. 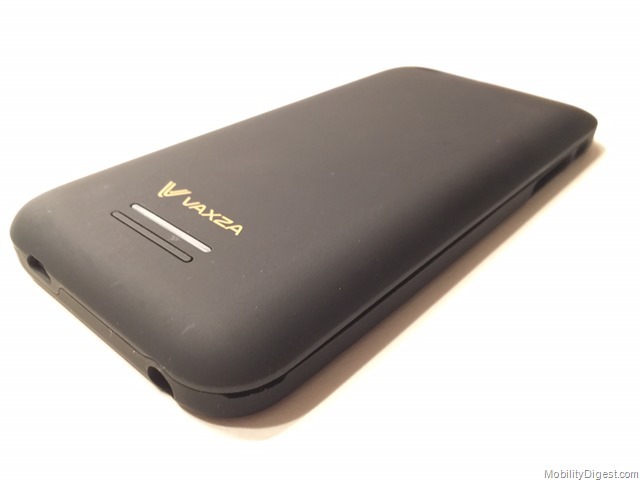 Today I am going to review the Vaxza iPhone six battery case. 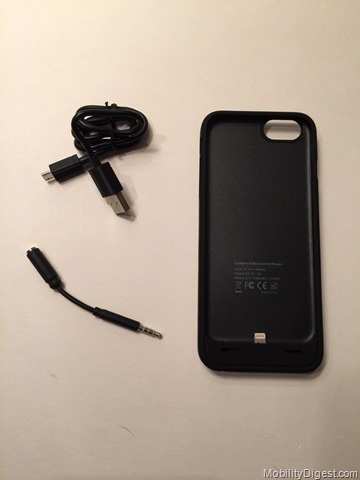 The Vaxza iPhone 6 Battery Case comes with everything you need to get you going. You may be asking yourself why in the world is the audio adapter included? Well that is because you need that to plug in through the Vaxza iPhone 6 Battery Case to get to your 3.5mm audio jack on the bottom of your iPhone 6. A standard audio cord would not fit through the narrow opening. I don’t care much for this because it is yet another thing to keep up with and undoubtedly will get lost. I had a little trouble opening the case initially and found that a rounded paper clip would pry the two pieces of the case apart easily and without scratching. Sliding the iPhone is pretty easy and the top bezel piece then goes on securing the iPhone to the case. The inside of the case has a rougher finish to it which will decrease any slipping and sliding and scratching. 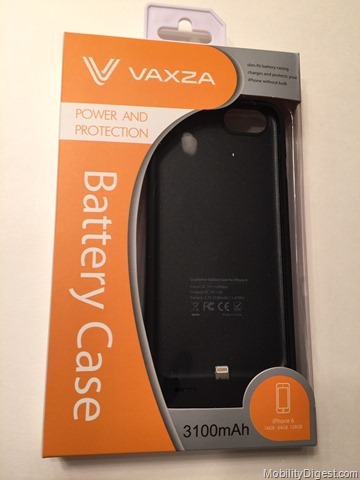 After installing your iPhone 6 into the pre-charged Vaxza iPhone 6 Case you will notice on the back side (picture above) there there is a LED bar and an equal length button. Depressing the button will light up the batter strength LED light and let you know how much charge you have left. There are 4 LEDs which represent 25% of the total battery life in the Vaxza case. The total time to recharge your iPhone with the Vaxza case is 3 hours but that is if you are not using it at the same time. I mentioned above the extra audio adapter to get headphone to work properly with the Vaxza case so you must be wondering about the sound without using headphones and what ensconcing your device in the case will make the sound like? It’s actually very good and Vaxza redirects the sound not out through the bottom, but out the front. It’s pretty effective and you will not lose any audio quality. Vaxza states that their case will give you 14 hours more talk time (who talks on a phone?) and up to 8 more hours of app time (now your talking). I can tell you that the Case did get me completely charged back up but that my actual app time improvement was a little less than 8 hours. Having said that what I think customers and readers want to know is will it make me get through the day without plugging in? The answer to that is yes. Even playing Clash of Clans and watching YouTube videos I was still able to get a full day out of my iPhone. The trade off with the Vaxza or any other built in battery case is the extra girth you will have to endure. Vaxza does a really nice job with keeping the total size of their case to a minimum while still packing 3100 mAH of battery in it. However it is still quite large. The total length of the case is 6.10 inches long. Yep, it’s pretty big. The width however is very nice and only adds minimal amount of width at 2.82 inches wide. The width is just slightly over 1/2 inch at .60 inches. The regular pricing being $69.99. 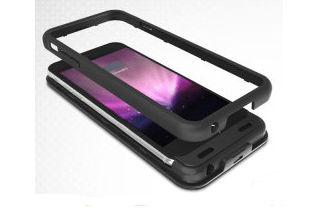 This is a great value and some regular cases cost as much as this without the added benefit of the battery! 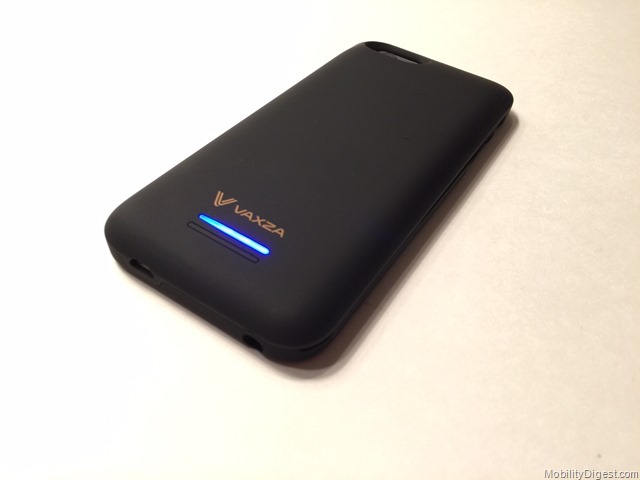 For this price I highly recommend the Vaxza iPhone 6 Battery Case for serious consideration. If you are a road warrior and find yourself without power constantly this is a great option for you to have. The Vaxza case looks great, it’s well made, and will get you through the day without visiting an AC Plug in most cases.